The Wyoming Cowboys held a 16-13 lead at halftime and extended that lead to 19-13 on its first possession of the second half. But the Cowboys were unable to score any points thereafter, while the Washington State Cougars scored a touchdown in the third and three TDs in the fourth to capture a 41-19 win over the Cowboys in Laramie. Wyoming was able to record 6.0 tackles for loss on the day, but was unable to record a single quarterback sack. The Pokes did force two WSU turnovers — a fumble that was forced by and recovered by sophomore defensive end Garrett Crall that led to Wyoming’s first touchdown and an interception by redshirt junior cornerback Antonio Hull that led to UW’s second TD. The game began with a pair of scoring streaks. Washington State struck first, moving the ball 68 yards down the field on the opening drive of the game, before the Cowboy defense stiffened and the Cougars were forced to settle for a 24-yard field to take a 3-0 lead. After a three-and-out on the Cowboys’ first possession, Washington State took over on its own 37-yard line. WSU would drive 63 yards in 10 plays aided by two personal foul penalties on the Cowboys. Cougar quarterback Gardner Minshew would find running back James Williams on a two-yard touchdown pass. Blake Mazza added the extra point, giving WSU a 10-0 lead. 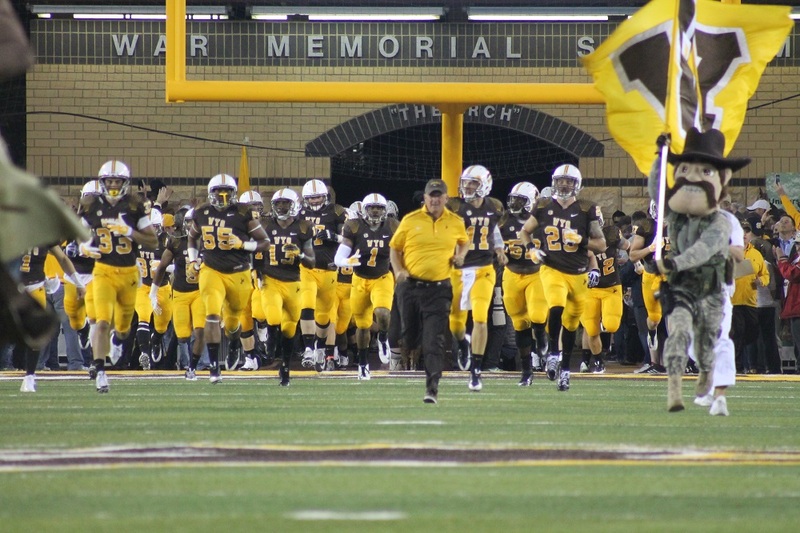 Wyoming was forced to punt on its next possession, but it would be the Cowboy special teams that would generate the first points of the day for the Pokes. The Cowboy defense forced a three-and-out and after a high snap from center on Washington State’s punt attempt, Cowboy freshman running back Jevon Bigelow tackled WSU punter Oscar Draguicevich III in the end zone for a safety, making the score 10-2. The Cowboy defense then did what they do best, force a turnover. The Pokes, who led the nation in takeaways a year ago, with 38, got their first takeaway of the 2018 season when Crall took the ball away from WSU running back Max Borghi on a short screen pass, giving Wyoming the ball at the WSU 30. A key eight-yard completion on second down from Cowboy redshirt freshman quarterback Tyler Vander Waal to junior wide receiver Austin Conway combined with four carries for 24 yards by senior running back Nico Evans, including an eight-yard TD run, gave the Cowboys their first touchdown of the day. The PAT by junior place-kicker Cooper Rothe pulled Wyoming to within one at 10-9. Washington State responded with a nine-play, 51-yard drive, gaining all but two yards on passing plays, but Wyoming’s defense once again kept the Cougars out of the end zone, forcing a 41-yard field goal by Mazza. That extended WSU’s lead to 13-9. After a punt by the Pokes on its next possession, the Wyoming defense would force it’s second turnover of the day on Hull’s interception that gave the Cowboy offense the ball at its own 46-yard line. Cowboy quarterback Vander Waal would throw his first interception of the season on the Pokes’ next possession, but neither team would threaten to score the remainder of the half and the score remained 16-13 in favor of the Cowboys at halftime. The second half would begin with the Cowboys taking their opening possession 62 yards on 13 plays. Evans started off that drive with four carries for 35 yards, including an 18-yard run, but it would be the last carries of the day for the senior. After the game, Bohl would tell media that Evans had suffered a rib injury. The big play of the drive was a 23-yard pass from Vander Waal to junior wide receiver Raghib Ismail Jr. The drive would end at the WSU 13 where Rothe would cap off the drive with a 30-yard field goal to stretch the Pokes’ lead to 19-13. Things were looking good for the Cowboys at that point, but the Rothe field goal would end up being the final points of the day for Wyoming. On its very next possession, the Cougars put together a 10-play drive covering 75 yards, culminating in a six-yard TD pass from Minshew to running back Borghi as WSU regained the lead at 20-19 with 3:51 remaining in the third quarter. That would be the end of the scoring in the third. Not only was the score heading into the fourth quarter only a one-point margin at 20-19 in favor of Washington State, but the offensive numbers were fairly close as Wyoming had 186 yards of total offense and Washington State had 238. But the fourth quarter would go the way of the Cougars. WSU would score three TDs and add another 156 yards of total offense, while the Cowboys went scoreless in the fourth quarter and generated only 20 yards of total offense in the quarter. The final numbers — Washington State 394 yards of total offense and Wyoming 206. Not having running back Evans for the majority of the second half definitely hurt the Cowboys. When he left the game, he had rushed for 89 yards on 18 carries, had one TD and was averaging 4.9 yards per carry. Freshmen running backs Bigelow (42 rushing yards on 11 carries) and Xazavian Valladay (15 yards on four carries) came into the game and did a nice job of trying to replace Evans, but the experience of the senior was missed. Vander Waal ended the day 8 of 20 passing (40.0 percent) for 67 yards, one interception and no touchdowns. Evans’ 89 rushing yards led the Cowboys and Conway was the leading receiver for the Pokes with three catches for 18 yards. Price (23 receving yards) and Ismail (21) led the Pokes in receiving yards. Minshew completed 38 of 57 passes (66.7 percent) for 319 yards, one interception and three TDs. Williams led the Cougars in rushing with 82 yards on 16 carries and one rushing touchdown. He also led WSU with 10 receptions for 53 yards and one receiving TD. Receivers Jamire Calvin, 82 receiving yards, and Tay Martin, 73 receiving yards, led the Cougars in receiving yards. 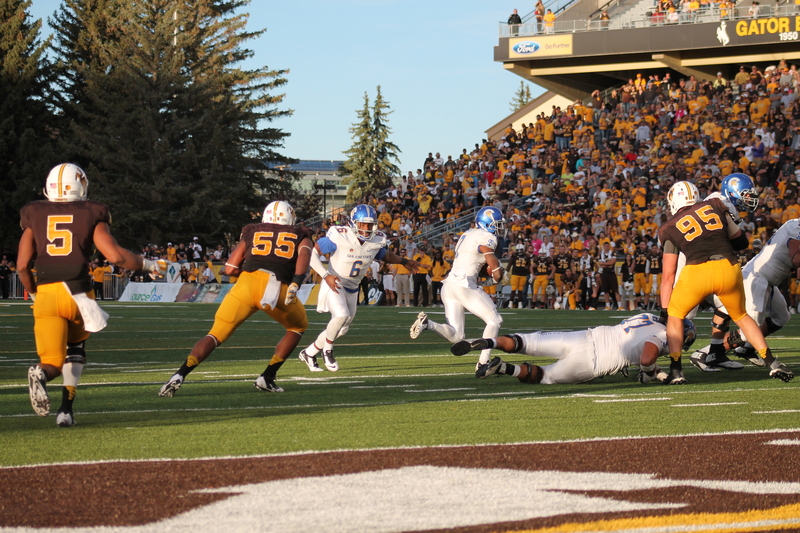 Defensively, Wyoming was led by middle linebacker Logan Wilson, who recorded 12 tackles and 1.0 tackle for a loss. Cowboy free safety Marcus Epps had eight tackles and a pass breakup, and strong-side linebacker/nickel back Chavez Pownell Jr. ended the day with seven tackles and 0.5 TFLs. Washington State’s defensive leaders were: free safety Skyler Thomas (nine tackles) and linebacker Dominick Silvels (six tackles, 2.0 TFLs and 1.0 sack). Next Saturday, the Cowboys will travel to Columbia, Mo., to face the Missouri Tigers in a game scheduled to kick off at 5 p.m., Mountain Time.